Rivers State Governor, Nyesom Ezenwo Wike has declared that the Peoples Democratic Party (PDP) will win the Presidential election in 2019 because Nigerians yearn for the return of pro-people leadership. L-R: Abia State Governor, Okezie Ikpeazu, Rivers State Governor, Nyesom Ezenwo Wike, PDP National Chairman, Prince Uche Secondus and Delta State Governor, Ifeanyi Okowa during the meeting of the National Working Committee and PDP Governors Forum in Asaba on Sunday night. “We are going to win the Presidency in 2019. We take it for granted that we have won our governorship, National Assembly and State Assembly seats”, he said. The governor added: “Frankly speaking, If Nigeria is a country where democracy is democracy, so many won’t talk about contesting election. Because first of all you need to tell the people what you have done for them. “What will they come to tell Delta people that they have done in the area? Nothing. What is their confidence? What will they say they have done in the Niger Delta? He said: “Part of corruption that we must fight is the corruption of stealing people’s mandate. That is the biggest corruption. 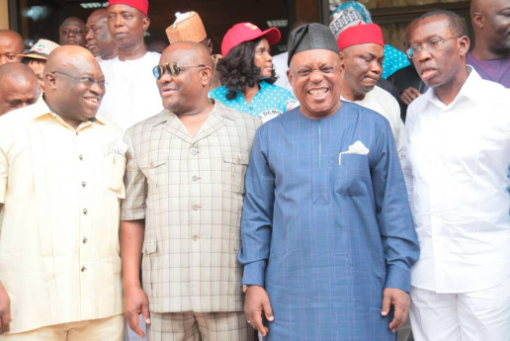 The post PDP will win the 2019 Presidential election, says Governor Wike appeared first on Vanguard News.